October 15, 2013 - On Monday a second A350 XWB landed back at Toulouse-Blagnac Airport France after successfully completing its first flight, the flight lasted five hours. 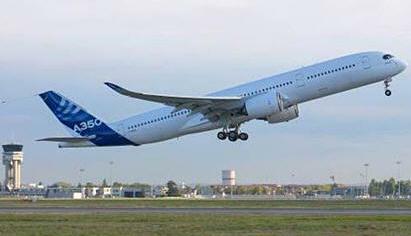 The A350 XWB test aircraft, MSN3, was flown by Frank Chapman and Thierry Bourges, Airbus Test Pilots. Accompanying them in the cockpit was Gerard Maisonneuve, Test Flight Engineer, while three Flight Test Engineers; Tuan Do, Robert Lignee and Stephane Vaux monitored the progress of the flight profile. The MSN3 is similar to A350 XWB MSN1 however it has no cabin but is equipped with heavy flight test installation. The Airbus A350 XWB is a long-range, two-engine widebody jet airliner developed by Airbus. The A350 is the first Airbus with both fuselage and wing structures made primarily of carbon fiber reinforced polymer. A350 XWB will be equipped to carry 250 to 350 passengers in a typical three-class seating layout, or maximum seating of 440 to 550 passengers, depending on variant. The A350 was originally conceived in 2004 as a largely new design, but with a fuselage based on the A330. In 2006, Airbus redesigned the aircraft and renamed it the A350 XWB (extra wide body). The first A350 XWB (MSN1) took off on June 14, and has to date flown some 330 flight test hours in almost 70 flights. These flights have been devoted to the identification and freeze of all flap and slat configurations, loads and aeroelastic testing and evaluation of the aircraft’s handling characteristics and systems’ operation throughout the operational envelope. Three more A350 XWB test aircraft will join MSN 1 and 3 to perform the planned 2,500 hours up to Type Certification. Airbus has stated that A350 XWB will be more fuel-efficient and have operating costs up to 8% lower than the competing Boeing 787 Dreamliner. The A350 XWB has already won 725 firm orders from 37 customers worldwide. First delivery is planed second half of 2014. The launch customer for the A350 is Qatar Airways, which ordered 80 aircraft of all three variants. Development costs are projected to be US$15 billion. What Made Texas Attorney General Drop Lawsuit Against American Airlines Merger?